This facility for Merced County was sited on a vacant lot directly adjacent to, and communicating with, an existing Police Station. At 14,800 sqft., the building provides spaces for county judicial branch offices, a municipal courthouse, and Sheriff’s offices. It serves to supplement the Police Station by accommodating office, clerical, and storage space unavailable in the existing station, as well as provide for secure transfer of the arraigned to and from the Courtroom. 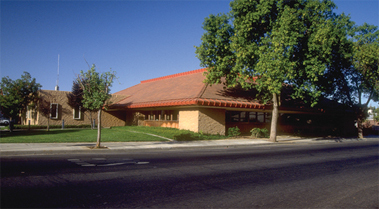 The building is distinguished by a prominent hipped roof form finished with rust-red composition shingles (originally intended to be flat clay tile) with upper and lower edges trimmed in high-relief standing seam metal, also red in color. The roof hides a deep, central well that contains not only the HVAC equipment, but a hexagonal diffusing skylight for the courtroom and perimeter operable clerestory windows allowing natural daylighting and ventilation for the office spaces below.